Midway Atoll is ruled by the birds again, after a short stay by humans during the twentieth century. “Pihemanu” is the Hawaiian word for Midway: “loud din of birds” is an apt descriptor for the location of the world’s largest nesting colonies of Laysan and Black-footed Albatross. 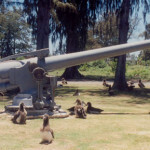 Midway is one of the best known of all the outlying Pacific islands due to the tide-turning Battle of Midway in WW2. It lies about 1300 miles west of Honolulu and 1200 miles east of Wake Island. These distances proved ideal for the refueling requirements of early twentieth century aviation, both commercial and military, as they have for millions of seabirds for millions of generations. Midway and Wake were “sister projects” during the prewar naval base construction projects and share many physical and historical similarities. The two are typical Pacific atolls with fiercely resistant surrounding coral reefs and flat, limited land space. Midway atoll is comprised of three islets: the largest, Sand Island; Eastern Island; and tiny Spit Island between them. Modern photographs show graceful palms and thick Norfolk pine and ironwood, all invasive species brought in by early cable company residents craving some shade. Midway was established as a National Wildlife Refuge in 1988 and lies within the Papahanaumokuakea Marine National Monument (PMNM). It is also the site of the Battle of Midway National Memorial. Midway has been closed for several years to visitation and wildlife conservation projects due to reduction of federal resources and operations. 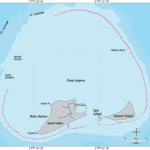 The Fish and Wildlife Service is custodian of the atoll. In 1867 Midway became the first offshore island annexed by the United States. With the exception of Japanese fishermen who often camped there and collected bird feathers and eggs, little attention was paid the lowly atoll. In early 1903 U. S. President Teddy Roosevelt placed Midway under the control of the navy to bring an end to the “poaching” activity, and within a few months the Commercial Pacific Cable Company was appointed island custodian. (Wake Island, a “mere dot on the waste of waters,” had been bypassed for a cable station.) Pacific cable-laying operations took place quickly, linking San Francisco, Honolulu, Midway, Guam, and the Philippines, and on July 4, 1903, TR placed the first “round the world” cable message. Four ghostly buildings of the cable company still stand on Sand Island, as well as descendants of the trees, insects, and canaries that company members brought with them over a hundred years ago. In 1935 Pan American Airways dispatched the S.S. North Haven, with men and supplies to build stations on Midway, Wake, and Guam for its transpacific Clipper fleet linking the mainland and Asia. “The Pan American Clipper route traced a bright arc over a complex Pacific situation of which it was an integral part. 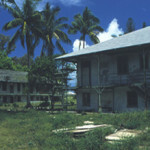 It was not a coincidence that the U.S. Navy slated the island pearls in the airline’s Pacific necklace for future naval air bases.” (Building for War, 25) The “Pan Air” pioneers dynamited coral heads in lagoons for runways and threw up station buildings and soon the pre-fabricated hotels that were mirror images on Midway and Wake. The first westbound clipper flight took place in August 1935 and within a few months the airline was making round trips between San Francisco and Manila. At Midway passengers rode a motor launch from plane to pier and a station wagon carried them to the “Gooneyville Lodge” where they enjoyed watching the antics of the ever-present albatross on the grounds as they stretched and nodded in their timeless choreography. In the spring of 1940 navy contractors began work on a naval air station on Midway, a project that was plagued by problems from the start. When Morrison-Knudsen Company joined the CPNAB consortium later that year, it took over the challenging Midway project, as well as two projects still on the drawing boards: Wake Island and underground fuel storage tanks on Oahu (Red Hill). The Midway and Wake projects shared plans and equipment, and many of the men knew each other. A good-natured rivalry prevailed through 1941, though Midway’s head start allowed the navy to commission its completed naval air station in August 1941, while Wake was still incomplete when war came in December. As on Wake, a detachment of marines brought in shore guns and antiaircraft batteries on Midway and a squadron of fighters arrived shortly before the outbreak of war to protect the installation and 1600 civilians. Unlike Wake, the defenders saw little action, shelled just one night by Japanese warships after leaving Pearl Harbor on December 7. Midway’s main role in the war would occur six months later when the U.S. Navy, forewarned and prepared for a Japanese attack on Midway, mounted a fierce battle that took out four Japanese carriers and over three hundred aircraft. Midway’s land and seaplane facilities and wartime-constructed submarine base formed a strong outpost through the war. Midway stayed busy during the Cold War era, refueling and servicing transports for the Korean and Vietnam Wars, and was home to thousands of support personnel. The military installed a top-secret, super-sensitive listening post to track Soviet submarines, erected antenna fields on Midway, and dispatched radar plane patrols as part of the Distant Early Warning (DEW) Line. By the late 1970s, however, the naval facility was downgraded and in 1993 permanently shut down, with the navy transferring control to Fish and Wildlife. Control might be with FWS on paper, but a bazillion albatross occupy the grounds, oblivious to people and paper, bobbing and weaving to their own timeless music on Midway Atoll.